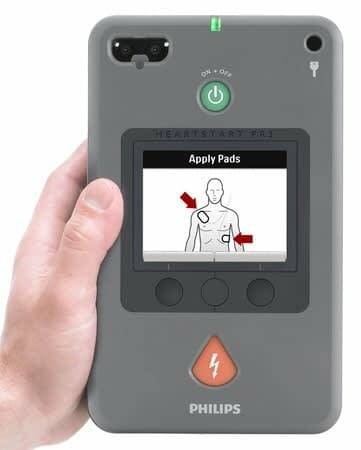 The best professional-grade Philips AED yet, the HeartStart FR3 is designed to make lifesaving faster, easier, and better. The Philips HeartStart FR3 AED is the smallest and lightest (3.5lbs, 1.6kg) professional-grade AED among leading global manufacturers. This AED holds the IP55 rating for protection against dust and jetting water. It has also been tested to US Military standards. The CPR Metronome keeps the beat for consistent chest compressions, and Quick Shock reduces the time between hands-off and shock delivery to minimize CPR interruptions. SMART CPR provides patient-specific treatment advice for the right initial therapy – CPR or defibrillation – even for shockable rhythms. 5 year warranty.